First, Cotter Smith was lured to Pittsburgh: When the nationally known stage and film actor came here to shoot hit the Netflix series Mindhunter, he and his wife liked it so much they relocated from New York. Then Smith got drawn into the latest barebones productions show: Rules of Seconds, John Pollono’s new dark comedy about the culture of dueling in 1850s America. Smith, 68, has Broadway and off-Broadway credits, and has shared stages with Sam Waterston and Denzel Washington; in the X-Men movie X2 he played the president, and he was Mindhunter’s Unit Chief Shepard. In Pittsburgh, through mutual friends, he met local director and playwright Melissa Martin, who passed him the Rules script. “I found myself on the train by myself, laughing out loud,” says Smith. “It’s a dark comedy. But it’s a very funny comedy.” Smith (pictured) plays powerful Boston businessman Walter Brown, who when a deal with the Leeds family goes south takes extreme measures to defend his honor. Barebones artistic director Patrick Jordan calls Rules an “unfortunately timely” play about “toxic masculinity.” Martin directs a large cast including Jordan, Pittsburgh favorites Robin Walsh (after a long hiatus from local stages), Wali Jamal and Connor McCanlus, and Smith’s Mindhunter co-star Jack Erdie. The show introduces the company’s newly renovated black-box space in Braddock, where it shares a building with restaurant Superior Motors (which is offering discounts to ticket-buyers). Rules playwright Pollono also wrote Small Engine Repair, which barebones staged in 2015, and the 2017 film Stronger. 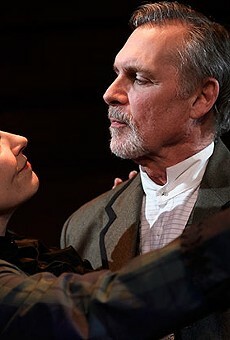 Smith (who’s now teaching acting in Pittsburgh) calls Rules “a play about male ego and male misbehavior ... a hilarious caricature.” Jordan adds that the play explores “what it means to be a man and in turn what it means to be a woman.” It’s also profane (the Los Angeles Times review of a 2017 production name-checked Tarantino) and, naturally, violent. “There’s a lot of blood in this one,” says Jordan.